I'm interested in information on Civil Asset Forfeiture and the Asheville Police Department. I don't quite know the right questions to ask, but I know certain one-time items, like the Evidence Room Audit, were paid for out of those funds. I'd like to know if APD still participates in that program, and if there is any information around how much money is available to APD as a result of that program. Is there an "account" with a balance, for example? I would also like to request any public records (if available) that describe the amount of money collected under that program from 2005 - 2017. Also, I would appreciate any information on what those funds can and cannot be used for, and who controls those spending decisions. We have this request and will get back with you as soon as possible. Message: “I’m interested in information on Civil Asset Forfeiture and the Asheville Police Department. I don’t quite know the right questions to ask, but I know certain one-time items, like the Evidence Room Audit, were paid for out of those funds. I’d like to know if APD still participates in that program, and if there is any information around how much money is available to APD as a result of that program. Is there an “account” with a balance, for example? 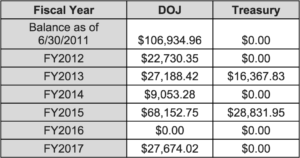 I would also like to request any public records (if available) that describe the amount of money collected under that program from 2005 – 2017. Of note: The requester also included in the “timeline” field of their submission to our website, that this request should apply specifically to the date range of January 1, 2005 – September 30, 2017.